The Audio Performance Transfer (APT) process is one of the major unique features of Revoice Pro. It aims to transfer performance characteristics of one audio signal onto one or more other signals. It works in four basic steps. 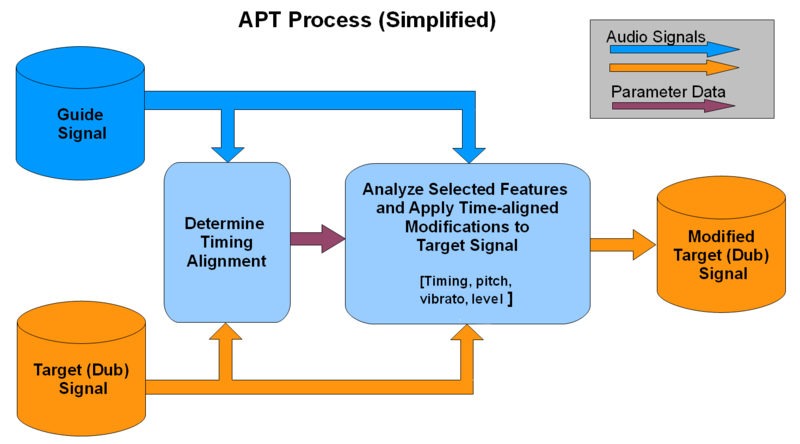 The APT process first determines the timing relationship between key features of a Guide and a Target (Dub) audio signal using improved Synchro Arts' VocALign® technology. Next, the process measures performance-related features (such as timing, pitch, vibrato and level) of both the Guide (which usually has certain preferred performance characteristics) and the Target. User-selected Guide performance features are transferred to the Target audio to create a new Modified Target signal with the selected Guide features. The transfer process usually includes the timing alignment, so Guide's features are incorporated at precisely the correct places along the Target. However, this is an option. The "tightness" of the transferred feature can be controlled to allow natural acceptable differences to pass through unchanged. Optional user-inserted "Protected Regions" allow selected sections of the Target signal to be left unchanged. "Process-based" monitor switching, via single keys, provides instant comparison of inputs and outputs one or two signals at a time. APT Pitch processing settings can be made time-varying.